Note: I just came out with this new homemade thin crust pizza dough. While this whole wheat crust is good, the new one is fantastic, however, the new one does take a long time compared this one. 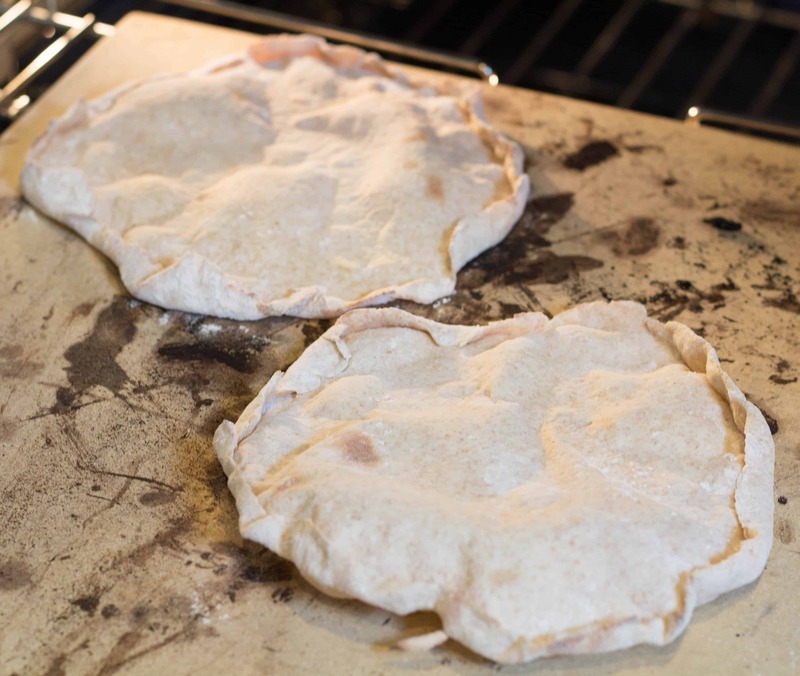 The new one is more of a traditional pizza dough – chewy, yet crispy. 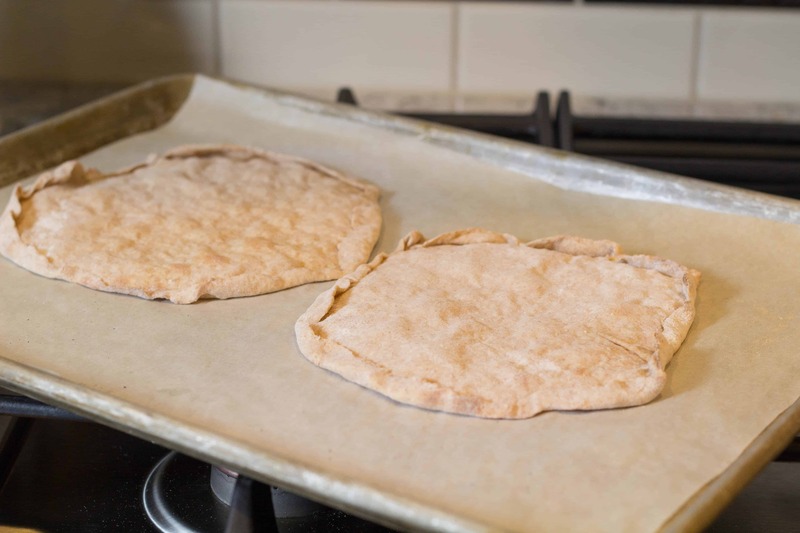 This Whole Wheat Pizza Dough is a quick and easy pizza dough recipe which I adapted to make it more smart point friendly. The reason the recipe quantity is on the larger side is because it’s nice to have these in the fridge or freezer. When you want to make a quick pizza, they are ready to go. 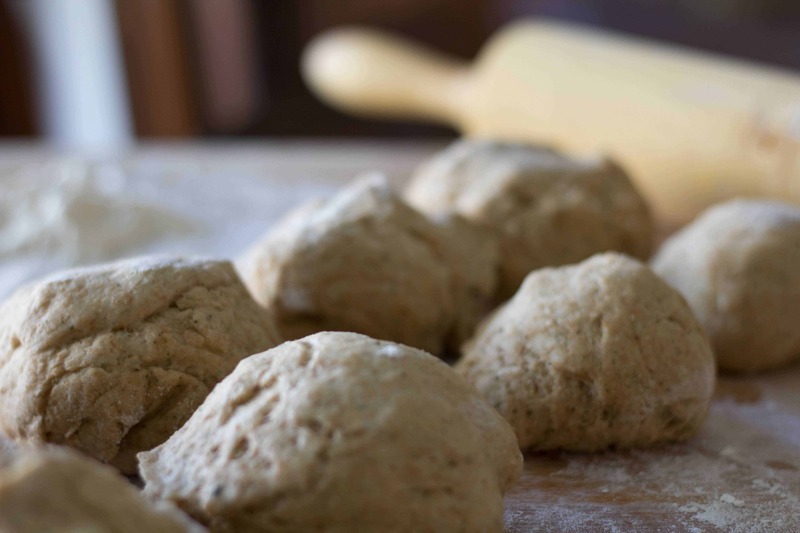 Divide the dough into 16 balls. Use what you need and save or freeze the rest for later. Individual pizzas also work well in my house because everyone likes something different. I like mushrooms and peppers on mine (hubby hates mushrooms and peppers) while my kids prefer pepperoni and cheese. Everyone can put on their own toppings and customize it the way they want. If I have time, I also like to bake the crusts ahead of time and have those ready to go in the freezer as well as the dough. 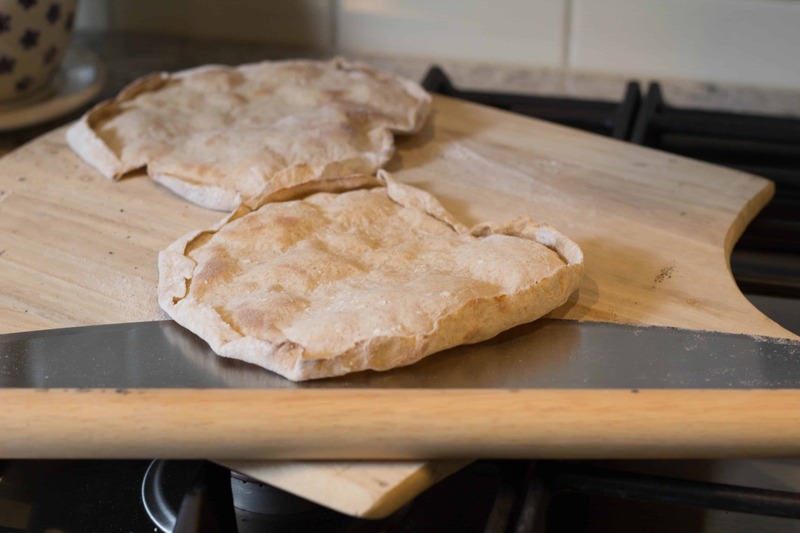 Using a pizza peel (the wooden board) makes it easier to slide the pizza dough onto the pizza stone and off using the cutter as a spatula. You can also use a cookie sheet lined with parchment paper. Just put the pizza dough onto the parchment and bake. Be care to watch the paper though, you don’t want it to burn too much and catch on fire. This was after I pre-baked the crusts for 5 minutes, so not a problem, but it’s always good to keep an eye on it. This is a great pizza dough which you can freeze and take out when needed. In a food processor, combine flours, yeast, salt, sugar and garlic cloves. Pulse until garlic is finely chopped. With the motor of the food processor running, gradually pour in the hot water. When the mixture forms a ball, process for about 30 seconds to “knead” the dough. If the mixture seems too sticky, add a few tablespoons of flour. 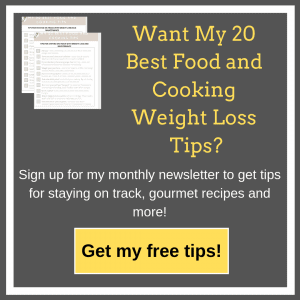 If you have a smaller food processor, mix all ingredients in a bowl and knead by hand. Transfer the dough to a large bowl which has been sprayed with oil. Cover. Let the dough rest in the bowl on the counter for about 20 minutes. 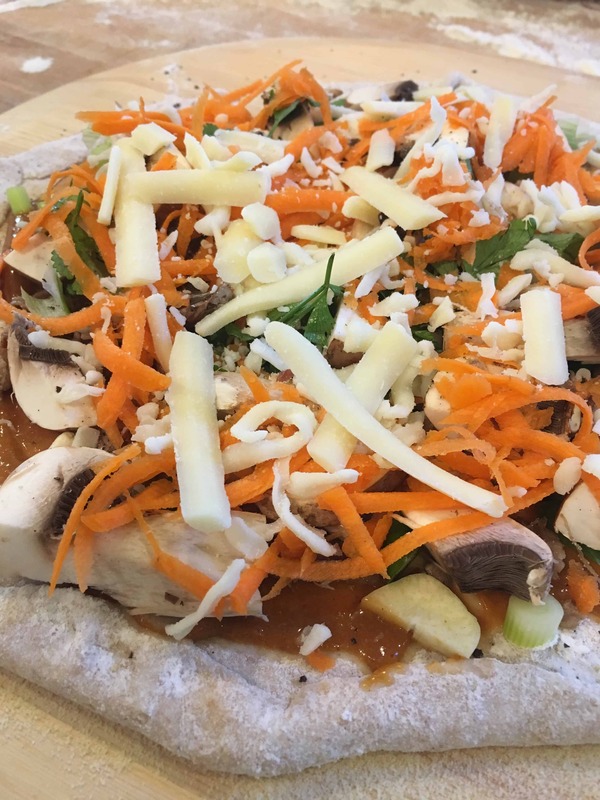 When ready to make the pizza, divide dough into 16 equal pieces to make 16 individual pizzas. If you don’t need all of the dough, store in refrigerator up to 5 days. Place pizza stone in the oven. Preheat oven to 500°. I really recommend pre-baking the crusts otherwise they don’t turn out crispy. Prebake the crusts on the stone for about 3 minutes. They will bubble up without topping so just take a spatula and push them down. Remove from oven and decorate with toppings. Then rebake for about 5-7 min or until hot. If you don’t have time to pre-bake (not recommended) you can also just place the crust on a pizza peel and then top the pizza as desired. (if you don’t have a peel, then just make it on a cutting board dusted well with flour. Use a big spatula and slide it directly on the preheated stone). This works well, but the pizza does not crisp up as much. Bake until the bottom crust in crisp about 6-10 minutes but watch it carefully toward the end so it doesn’t burn. Everyone’s oven is different. Place the crust on the parchment and bake the crust only for about 5 minutes. Remove from oven. Top with desired ingredients, then bake again for about 8 min or until cheese is melted and toppings are hot. Watch the crust so it doesn’t burn. If you plan on making the pizza crusts later, put the bowl in the refrigerator and take the bowl out about 30 minutes before using. 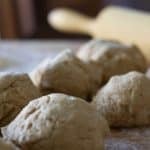 If you plan on freezing the dough, allow it to rest for about 20 minutes, then divide into 16 portions, wrap with plastic wrap and place in freezer bag and freeze. When ready to use, thaw out the night before in refrigerator. If you like super crispy crusts, bake the pizza crust first for about 5 min. on the pizza stone. Then put on your toppings and bake again until the cheese melts. This is my preferred method. I like to prebake the crusts all at once and freeze them for when I need them. Then I just “decorate” the pizza and bake. I’ve also made up frozen pizzas to have on hand. Be sure and pre-bake the crust, cool, add toppings, then wrap well and freeze. To bake, don’t thaw, just put in oven at 350° and bake until thoroughly heated. No Replies to "Whole Wheat Pizza Dough for Individual Pizzas"